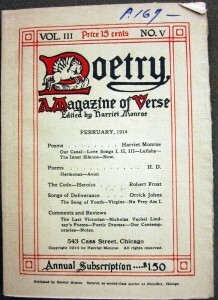 Searching for an artifact about the poet H.D., I came upon a volume of Poetry magazine. 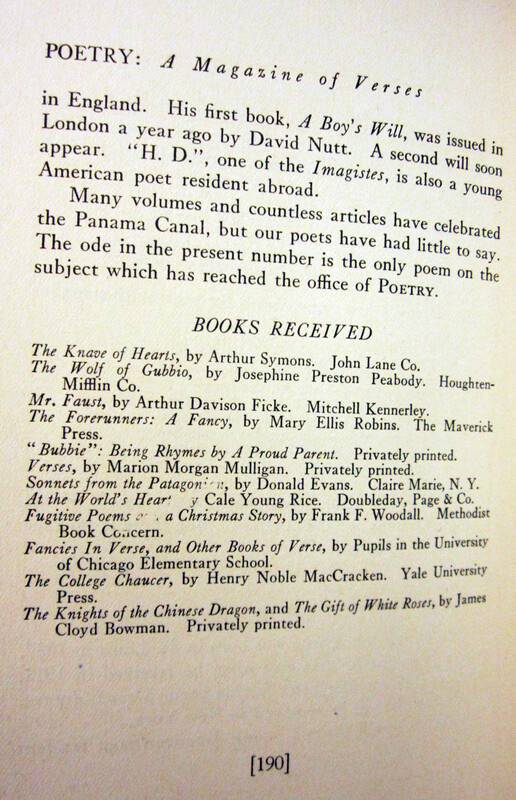 Although categorized under Robert Frost because he owned the volume and his poem was published in it, this small pamphlet of poetry also contained work by H.D. 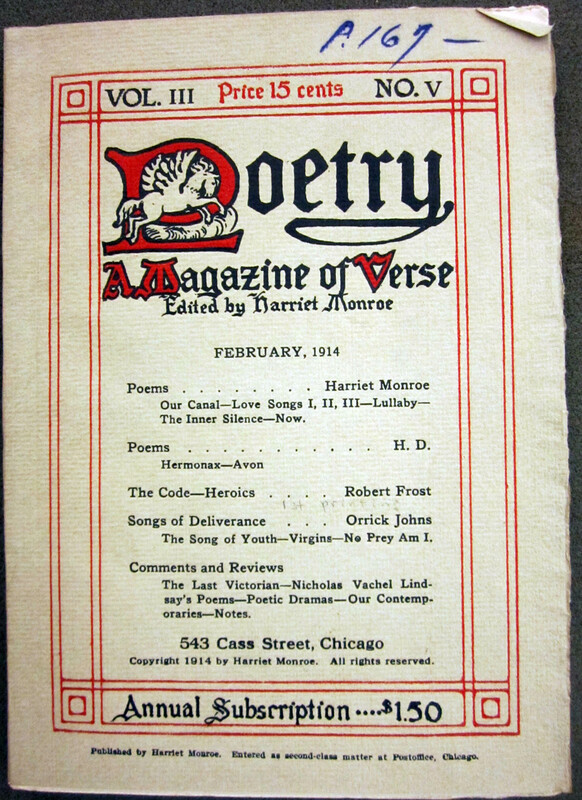 Poetry magazine began in 1912 by Harriet Monroe and still continues today. It has published works and helped solidify the careers of many major modern poets including T.S. Eliot, Ezra Pound, Robert Frost, Marianne Moore, and H.D. 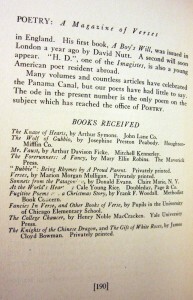 At the Watkinson I found Volume 3, Number 5 of the magazine, published in February of 1914. What I found interesting about this volume of Poetry is that we can see how H.D. was regarded in this moment of time. H.D. (1886 – 1961) began her career as a poet in 1912 as one of the founding members of the Imagist movement. Although Ezra Pound considered her an integral member of the movement, her importance in modern poetry took some time to be recognized by the reading public, which can be seen in this volume of Poetry. She published two of her poems here, “Hermonax” and “Acon,” however “Acon” is incorrectly spelled as “Avon” in the magazine. 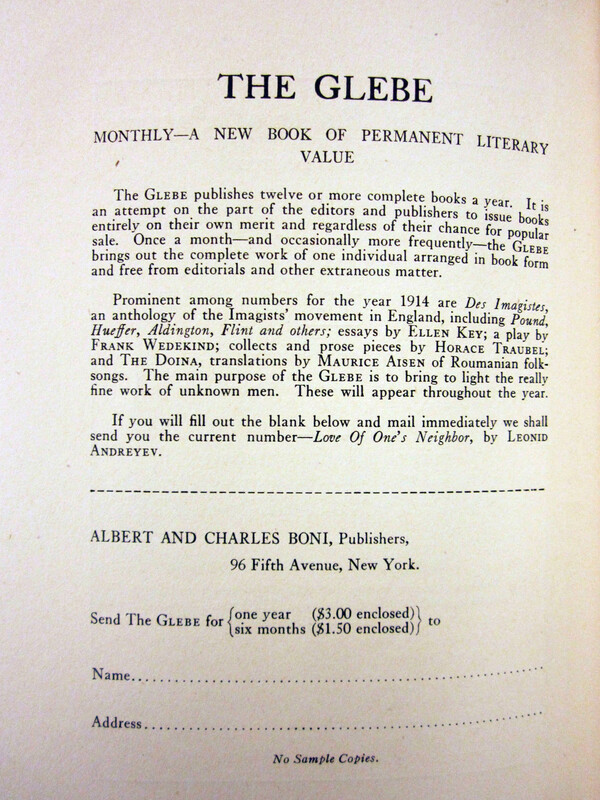 At the end of the volume there is an advertisement for The Glebe, a monthly publication similar to Poetry magazine. 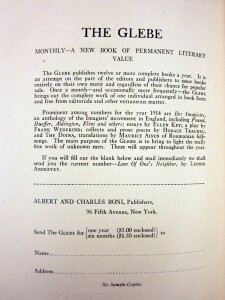 In this advertisement they mention prominent issues they have recently published, including Des Imagistes, an anthology of Imagist poetry. Listing the authors in this volume, they include Pound, Hueffer, Aldington, and Flint. Curiously, H.D. is left off of this list, although she did contribute to the anthology, and Pound considered her just as important as himself in the Imagist movement. It is clear in this volume that H.D. hadn’t yet established her reputation in modern poetry. Her progress as a poet can be traced through Poetry magazine, especially after her collection of poems Sea Garden was published in 1916. 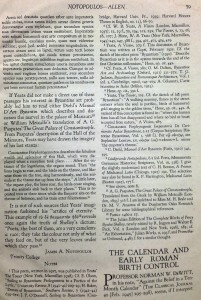 Later volumes of the magazine mention H.D. in high praise, often grouped together with Pound and other modern poets. 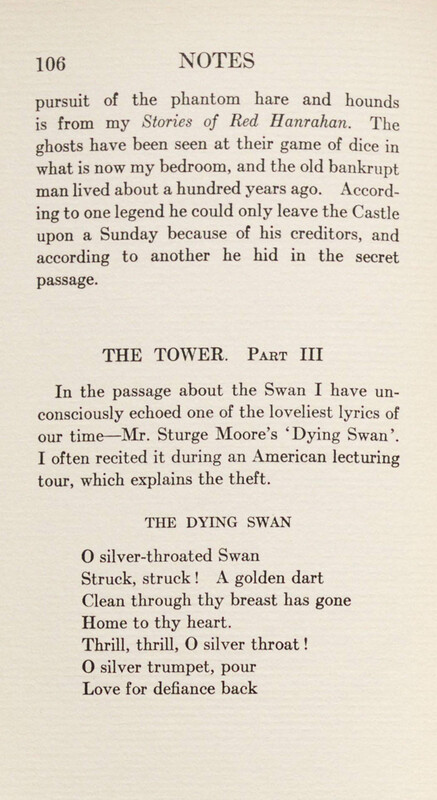 Max Michelson wrote in Volume 8, Number 2, published in 1916: “To me a collection of modern poems is incomplete without H. D. and four or five other writers.” Through this small monthly pamphlet of poetry, we can see the rise and maturation of a major modern poet. Not only can we trace H.D.’s reputation as a modernist through Poetry magazine, we can also see her individual identity being shaped through the various transformations of her name. When H.D. was first introduced in Poetry magazine in 1913, she was called “H.D., Imagiste.” This was a name Ezra Pound had given to H.D. when he edited and published her first poems. Not only did Pound transform H.D.’s poetry to his own vision of Imagism, he also branded her an Imagist in her name. The obscure initials, the use of the feminine ending, and the quotations around her name turned H.D. into an ethereal substantiation of Imagism itself. She became the muse and symbol of Imagism more than an established poet in her own right. When she is first described in Poetry magazine in Volume 1, Number 4, published in 1913, her identity is unknown, other than that she is an “American lady resident abroad.” However, once we reach the volume I found at the Watkinson, she has dropped the Imagiste from her name, and is called “H.D.” by the magazine. Still, though, the quotations remain and retain the air of mystery and elusiveness surrounding her image. Though coming into her own, H.D. was not yet considered a prominent poet; we cannot yet get to the direct treatment of who “H.D.” is. The quotations are eventually dropped from her name, and in later volumes of Poetry she is known only as H.D. This volume of Poetry shows us a moment in time when H.D. was disrobing her Imagist accoutrements and solidifying her status as a profound Modernist poet, and not just an Imagist poet under the guidance of Ezra Pound. What did I find in the Watkinson? 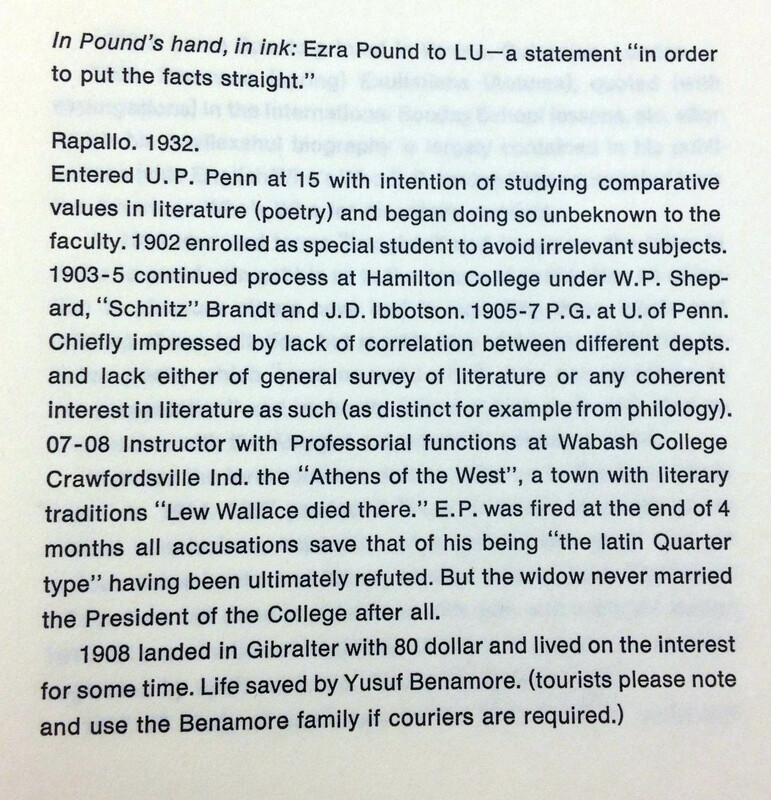 I found the 102nd copy of a 200-run printing of an Ezra Pound Autobiographical Outline from 1962. The “Outline” is Pound’s description of the events of his own life in ten pages of rice paper. He refers to himself in the third person throughout, either as “P” or “EP”. Pound stresses the need for his work to be read chronologically, and for his poems to be listed with their years of publication. He also expresses a general disdain for the publishing industry. He is incredulous that “NO american pubshr. had ever accepted a book on his recommendation! no am. univ. 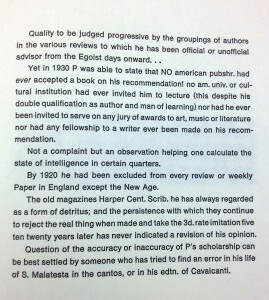 or cultural institution had ever invited him to lecture (this despite his double qualification as author and man of learning)”. Thus, in order to thwart the industry, he finds a manner in which he can self-publish. 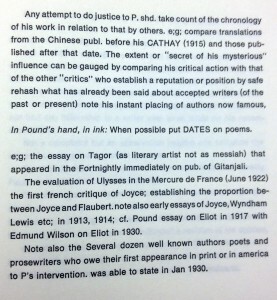 What interests me the most, though, is why Pound decided to publish an Autobiographical Outline at all. Why would his work necessitate an “Outline”? Did he not think his work would stand alone? Is there a need for Pound to run through his life and catalog it? 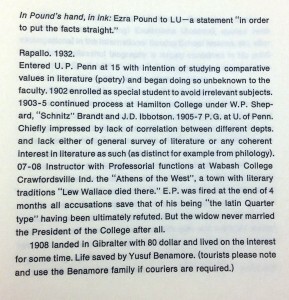 These pages are not notes on his work, but a way in which one can read more about Pound’s life. This is the Pound that Pound wanted to be known by. I’m also interested as to how the Watkinson acquired a copy, particularly since 26 copies of the 200 were reserved for “Nadja.” Nadja is listed alongside an address, as the only publishing information. 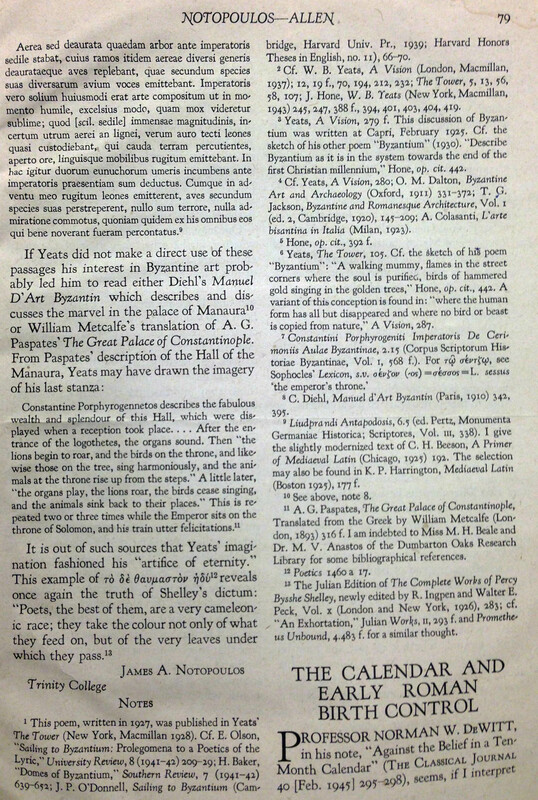 The year of publication is listed in the Watkinson catalog but only “March” is given as to context on the Outline itself. Perhaps to Pound, the season, the month, held more weight than the year. 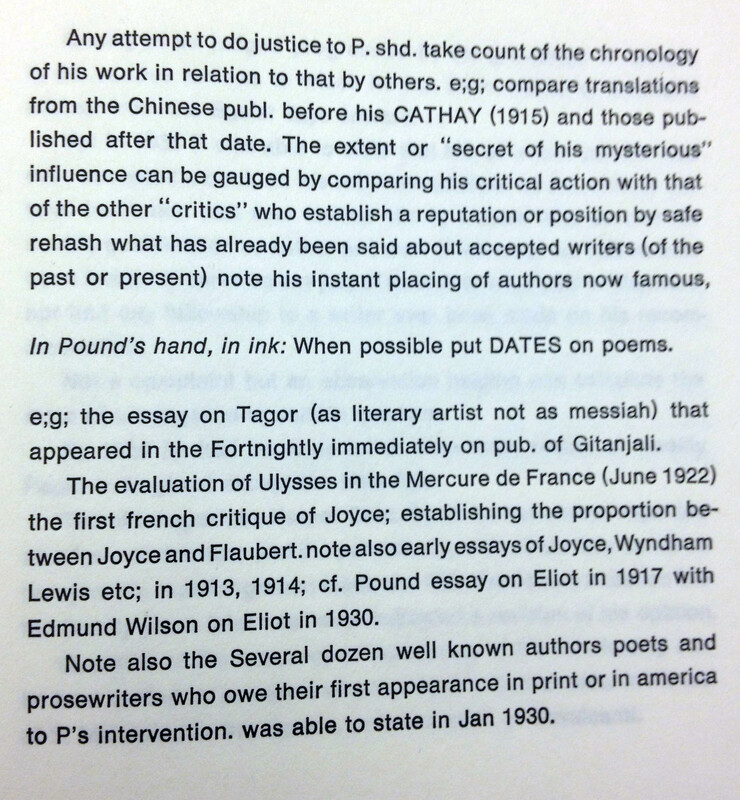 Pound also stylistically abbreviates words, like “publisher” (“pubshr.”) and “should” (shd). He does credit himself within the Outline as the inventor of the words “Imagiste” and “Imagism” (“in order to avoid vain gabble as to the nature of poetry”), so I wonder if his preference for clarity and brevity is merely exemplified by his shortening of words in the text. Imagism does pride itself on precision. That said, the entire outline is only 10 pages long, and only 7 of those pages have any words on them. The physical object of the outline is striking, also, because not only is the cover of the Outline purple rice paper, but the “Nadja” publishing information is printed in purple ink. The rest of the piece is printed in black. Having read T.S. Eliot’s “The Waste Land” transcript with Pound and Vivien Eliot’s notes, Pound occasionally used a purple crayon but I wonder if there was some inherent preference throughout his editing or self-editing life for the purple that resulted in the paper and ink choices. Pound describes the intricacies of his life as if they were someone else’s, “P”’s. He lists his accomplishments in a removed manner, but proceeds to credit himself throughout. Pound takes his own narrative, and tries to have his way with it. I was looking for some physical Pound-evidence in the Watkinson, preferably of the signature variety, but I find I am not disappointed. I did want to find something specifically his, and I have not failed in that endeavor. This small-run only had 200 copies printed, ever, in the whole world, and the physicality of the print and the paper speaks directly to Pound. It is not just his words, but also the way in which he presents them, that markedly links him to his work. James A. Notopoulos, the essay’s author, taught at Trinity College from 1936 until his death 1967, and was a member of the Classics Department as well as the Hobart Professor of Classical Languages. The Classical Journal, an academic journal published by the Classical Association of the Middle West and the South (an organization founded at the University of Chicago in 1905) since 1905, featured his article in November, 1945. The Classical Journal typically contains articles on Greek and Latin literature, language, and studies in general, in addition to book reviews. The fact that an article could be written about a piece of modernist poetry by a classics professor and subsequently published in a journal devoted to Classical studies speaks a lot to how the poem was received. 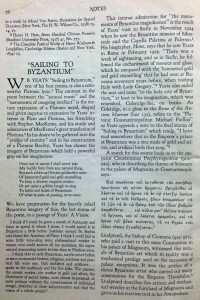 The article was published almost two decades after “Sailing to Byzantium” was written and nearly a decade after the author’s death – this speaks to how influential Yeats was, that his works continued to be relevant to those outside the world of literature years after they were published. It also shows Yeats’ strong relation to his history and his influences; Yeats had a tendency to focus on mythological and biblical subjects, often tying what he experienced in the modern world with the past. His connections to this time period were not only recognized, but studied by experts of the Classics and considered important enough to impact the field of Greek and Latin studies. The article itself contains several passages written entirely in different languages, one of which is in Latin, the other what I believe is ancient Greek. Although the article has many notes attached to the end, no translations are offered, only references to the works from which to quotes were taken. Clearly the article was meant to be read only by those that studied those languages and the books the passages were quoted from. 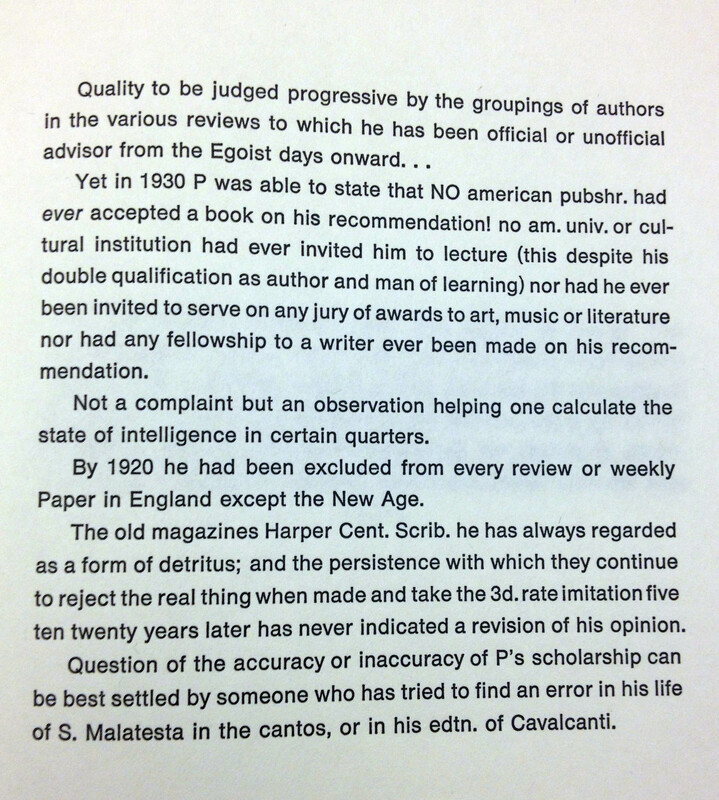 This points to an attitude of exclusivity that was common among modernist poets – i.e. that their poetry should be read only by well-educated people. While it may be that Notopoulos didn’t offer any translation because he presumed that readers of The Classical Journal would be familiar with the classical languages, it is also possible that this trend of exclusivity in modern poetry bled into other fields as well. Ironically, Yeats was not nearly as obscure in his poetry as other modernists, like Eliot and Pound, and (as far as I can remember) wrote his poems completely in English. 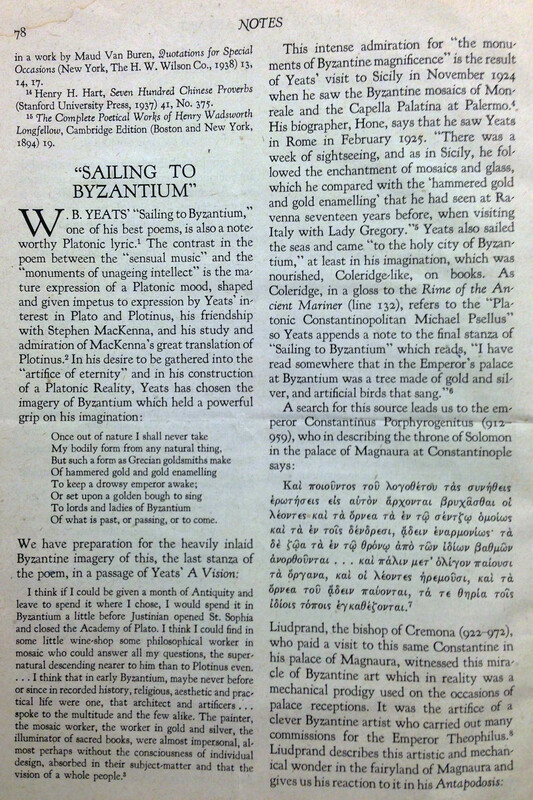 The article written by Notopoulos begins by stating that “Sailing to Byzantium” is a “note-worthy” Platonic lyric. He cites Yeats’ friendship with Stephen Mackenna (a translator of Plotinus and noted prose-writer) and interest in both Plato and Plotinus as giving the author inspiration for the poem. When Notopoulos speaks of a “platonic mood” or “platonic lyric” what he means is that Yeats is drawing on the Platonic theory of forms. Plato believed that the reality humans perceive is not in fact that true reality – that what we experience in our daily lives are only copies of the true or ideal forms that exist elsewhere. Everything in the world is only a copy of these true forms, and Plato’s ultimate desire is to reach the plane of ideal forms, which are both eternal and perfect. Notopoulos argues that when Yeats speaks of “the artifice of eternity,” what he means is the world of ideal forms described by Plato. Notopoulos then goes on to described what might consist of Yeats’ ideal world, drawing on experiences Yeats wrote about in his travels to Italy at the end of his life. 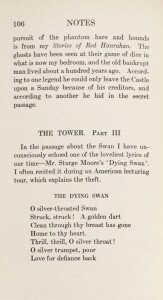 What I found at the Watkinson was the book of poems The Tower by W.B. 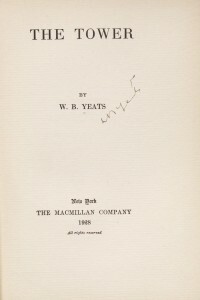 Yeats that was published in 1928. The book itself is a fascinating and intriguing part of history. The outside paper fold that encompasses the hard-cover book is a forest green with gold-like writing, and slightly torn edges. The paper of the book also caught my attention. It is a thicker material, with a rough texture that suggests it was specifically chosen. The pages are slightly yellow with worn edges. However, the original version may have had irregular edges. It is hard to tell whether or not this is due to aging or whether it is simply the type of paper that was chosen for a specific effect. Either way, it set a different tone for reading these poems. I had to handle each page with care, and frankly liked touching the paper (although I did refrain from excess touching to preserve the book!). The text on the pages was quite a change from the common font size 10 in cheaper paper-backs – the text was perhaps a font size 14-16 with about 2 inch margins surrounding the thick letters, which to my pleasure reminded me of a children’s story (and smiling I said to myself ‘Oh I would love to read a W.B. Yeats’ children’s book!’). 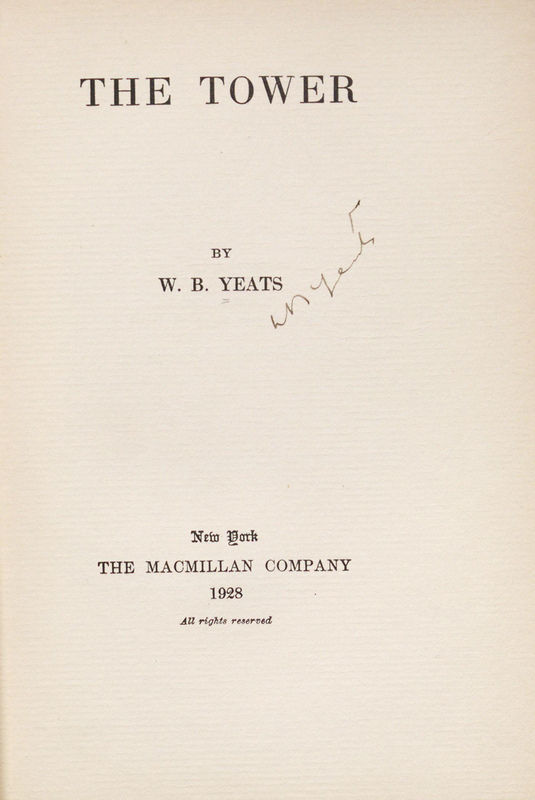 Opening the book and looking at the cover page, there in delicately pressed pencil, was Yeats’ signature, (which was confirmed to be legitimate). Looking at the signature, I wondered if he had always had the same style of if he changed his signature to just his initials and last name in order to better suite his life as a poet. In the back of the book were ‘Notes’ which Yeats added to give a small insight into some of his poems. I found his notes on the poem ‘Sailing to Byzantium’ to be particularly humorous. 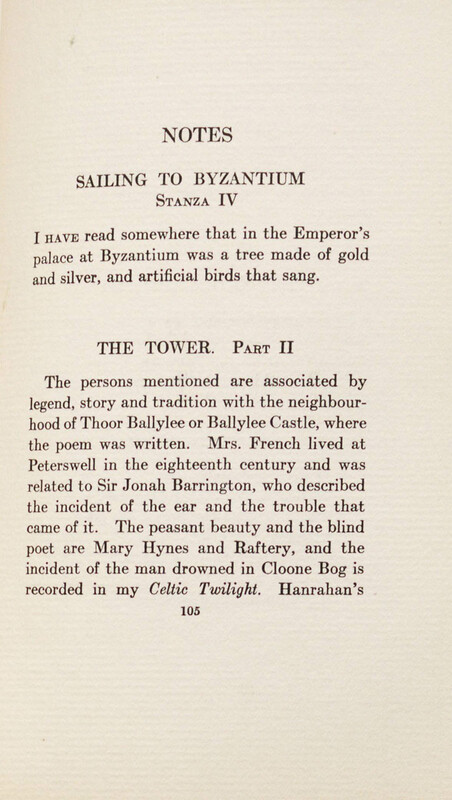 Specifically regarding stanza IV: “I have read somewhere that in the Emperor’s palace at Byzantium was a tree made of gold and silver, and artificial birds that sang” (105). After reading this, I chuckled – of all the notes he could have given the reader about this poem, he chose to say this. It is such a simple and matter of fact statement that at first it offers little. However, I considered this: Yeats is a man who hears about small snippets of marvelous things and incorporates them into his poems – or better, into the world he creates in his poems. For his poem ‘The Tower’ he provides more notes. In the poem, he talks a great deal about certain characters, and here he expands on who these people are – showing that these people are 3-D in his mind and that he puts immense amounts of thought into his poems. Sometimes when I read poetry, even when I read some of Yeats, I become a bit skeptical: that as I am trying to find meaning in the poem, the joke is really on me – the author merely created the illusion of hidden meaning (perhaps that is also an art form?) 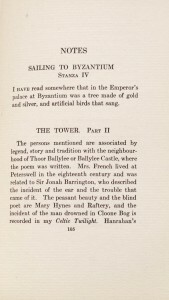 But reading these notes gives me a sense of security that Yeats had a vision and a true back story for his poems: “The persons mentioned are associated by legend, story and tradition with the neighbourhood of Thoor Ballyllee or Ballylee Castle, where the poem was written” (105). I only wish he could have drawn a picture of this location, but alas the poem with suffice. His notes on ‘The Tower’ continue about part III. Here he writes: “When I wrote the lines about Plato and Plotinus I forgot that it is something in our own eyes that makes us see them as all transcendence” (107). 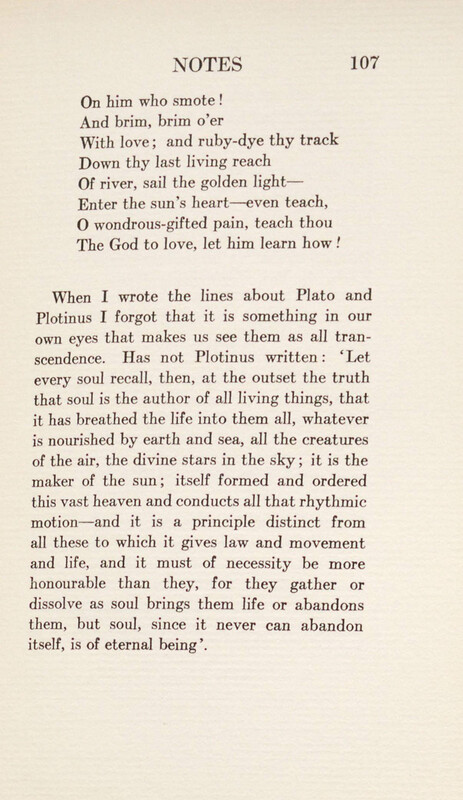 The lines he is referring to are: “And I declare my faith: / I mock Plotinus’ thought / And cry in Plato’s teeth,/” with the only other reference to them made in stanza I: “It seems that I must bid the Muse go pack, / Choose Plato and Plotinus for a friend/”. Here Yeats points out our tendencies to exalt people such as Plato and Plotinus and goes on to quote Plotinus to leave the reader no doubt that he is not ignorant of those philosophies. 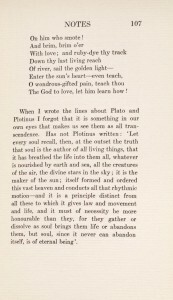 Clearly the philosophies of Plato and Plotinus were very important to him and influenced his thoughts (and thus his poems). The last part of the quote from Plotinus reads: “but soul, since it never can abandon itself, is of eternal being’ (107). This note offers insight into Yeats’ life views, and when kept in mind, relate to many of the works that I am familiar with. Holding this old book, looking at the large letters (flipping back to view his signature between poems) and reading the notes gave me a whole new experience with these poems, and for that, I am thankful that I found it at the Watkinson. You are currently browsing the I Found It at the Watkinson! blog archives for October, 2013.